Is your deck looking worn down and weathered? Not sure where to start? Mayo & Son Painting can help. 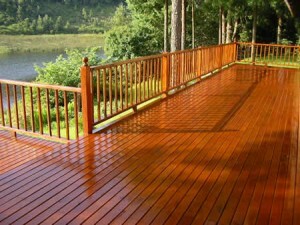 We have the expertise and experience to bring some new life back to your deck. Your deck should be an outdoor living space where you can enjoy the warm months of the year with family and friends and not constantly be worrying about the maintenance on it. Restoring your deck to an unbelievably beautiful finish involves more than just simply pressure washing your deck. In fact, if not carefully used, a pressure washer will actually do more harm than good. Blasting the surfaces with a high pressure cleaning will only cause damage to the wood. We use professional grade strippers and brighteners and then pressure wash the surfaces with low pressure. We let the chemicals do the work, not the high pressure. Stains and sealers are marketed everywhere to everyone. Claims that certain products will last for years and years are promised over and over, only to disappoint when the surfaces quickly become worn and dingy again. The key to any deck coating is maintaining that coating. Proper cleaining should be done on a yearly basis, and maintenance coats should be applied every few years. These steps will keep your deck looking magnificent. If you’re looking for a professional Rochester area deck care contractor, then give us a call today at 585-202-6769.